What can you do about dog separation anxiety? Dogs are pack animals and therefore by nature are not used to be on their own. However, sometimes you have to leave the dog home alone, e.g. while you work or when you are going out to dinner where dogs are not allowed. No dog should be left alone for prolonged periods, but most dogs can learn to be left alone for few hours at the time. Some dogs though really struggle with being left on their own. It has been estimated that up to 15% of dogs suffer from canine separation anxiety. There is no one reason for dog separation anxiety. Rescue dogs are though more likely to suffer from separation anxiety than dogs that have had one home since puppies. Dogs that have been rehomed before they are one year old, and especially dogs that have had many different homes, are most at risk of developing separation issues. Simply put, the loss of "pack members" can lead to separation anxiety in dogs. Change of family is not the only possible trigger though. Abrupt change in schedule, e.g. owner that used to work at home but now works outside the home for few hours a day, can lead to dog separation anxiety. As can moving to a new house, or change in the members of household, e.g. family member moving away or death in the family. Dog separation anxiety can show in various ways. Some dogs become destructive, while others are disruptive. Common separation anxiety symptoms include chewing, barking, howling, whining, urinating, defecating, vomiting, digging, scratching, and trying to escape. In the worst cases, the dog can stop eating, suffer from depression, and even hurt himself in trying to escape. Usually the first 15 minutes are the worst. The dog may show all the physiological signs of fear, e.g. increased heart rate. The dog may try to persuade you to come back by barking or howling or trying to escape by scratching at doors or chewing door frames. After this initial frantic period, many dogs settle down… to chew something that carries your scent. It may be your shoe, the book you were reading, or your favourite pullover. Often the dog chews the scented item into small pieces and curls up in the debris. Some behaviour specialists believe that by doing so your dog is forming a barrier of your scent for his protection. How best to treat dog separation anxiety? There are things you can do to reduce your dog separation anxiety but dog behaviour training is required to permanently resolve your dog or puppy separation anxiety. Dog behaviour training is the most successful way to deal with any dog behaviour problems, including canine separation anxiety. This is because dog behaviour modification training changes the dog's behaviour once and for all. Counter-conditioning can be used to successfully treat mild separation anxiety in dogs. The aim is then to associate being left alone with something good, e.g. delicious treat or favourite toy. This is done by giving the dog his special treat every time you leave the house. It is important that your dog only get this special treat when he is left home alone. You should therefore remove what's left as soon as you get back home. This is though unlikely to work if the dog is highly anxious when left alone. Nervous dogs will not eat or play when they are on their own. To treat moderate to severe canine separation anxiety combination of desensitization and counter-conditioning is required. Then you start by leaving the dog alone for short time and gradually increase the time he is left alone. This requires lot of patience from the dog owner and can take weeks (if not more) to accomplish. This can be tricky to do right (and can backfire if done wrong) so you may want to work with a qualified canine behaviourist if your dog suffers from severe separation anxiety. There are things you can do to reduce your dog / puppy separation anxiety. Exercise your dog before leaving him alone, the more tired he is (physically and mentally), the less energy he has left to expend when you leave. You may want to feed him small meal (as long as reasonable time after his exercise) and make sure he has access to plenty of fresh water (stress can make your dog thirsty). Every time we leave the house, we tend do certain things, like finding our keys and wallet, and putting on our coat and shoes. These are departure cues to our dogs. Have everything you need for leaving the house ready so you can keep departure cues and time to the minimum. Our dogs do reflect our feelings so be calm and assertive when leaving the house, it can help calming your dog down. Don't make a big deal when you leave or when you return, i.e. no talk, no touch, no eye contact. Leave your dog where he can do minimal damage to his environment, as well as to himself. Keep valuables out of reach and make sure he cannot chew anything hazardous, like electrical wires. If your dog is vocal when left alone, then try to leave him in a place where he is least likely to annoy your neighbours. Leave your dog in the house, not the garden, as he is likely to feel more secure inside than outside. Some dog owners leave their dogs in a crate when they leave the house, which of course mean the dog cannot cause damage to the house. Crates, when properly introduced, act as safe den where the dog can relax. However, they restrict the dog's movements and should only be used for short period if left locked. Better option may be to leave the crate open. That way the dog can seek comfort in his crate but still stretch his legs as needed. Give your dog something to occupy himself with while you are away, e.g. chewable toy or treat. Many find toys with treats inside can help to keep the dog occupied for the first critical minutes after you leave the house. Leave something with your smell for your dog to have in his bed, e.g. old t-shirt. Bear in mind that smell diminishes with time so you need to renew it on regular basis. Some dog owners keep old t-shirt in their laundry bag for this purpose and just take it out before leaving the house. Some dogs prefer some sound to quiet house. Leaving the radio or TV can help, but you can also record normal family conversation and play it every time you leave the house. If your dog's separation anxiety is severe, then your Vet may recommend dog anxiety medication. Anti-anxiety medication can help dogs with mild separation anxiety to get used to being left alone and then you can wean them of the medication. Combination of medication and dog behaviour modification training is though usually required. The medication can speed up the treatment progress and in the worst cases, dog behaviour training is not possible without the support of dog anxiety medication. Most anti-anxiety drugs for dogs have unpleasant side effects so most dog owners consider them as the last resort. 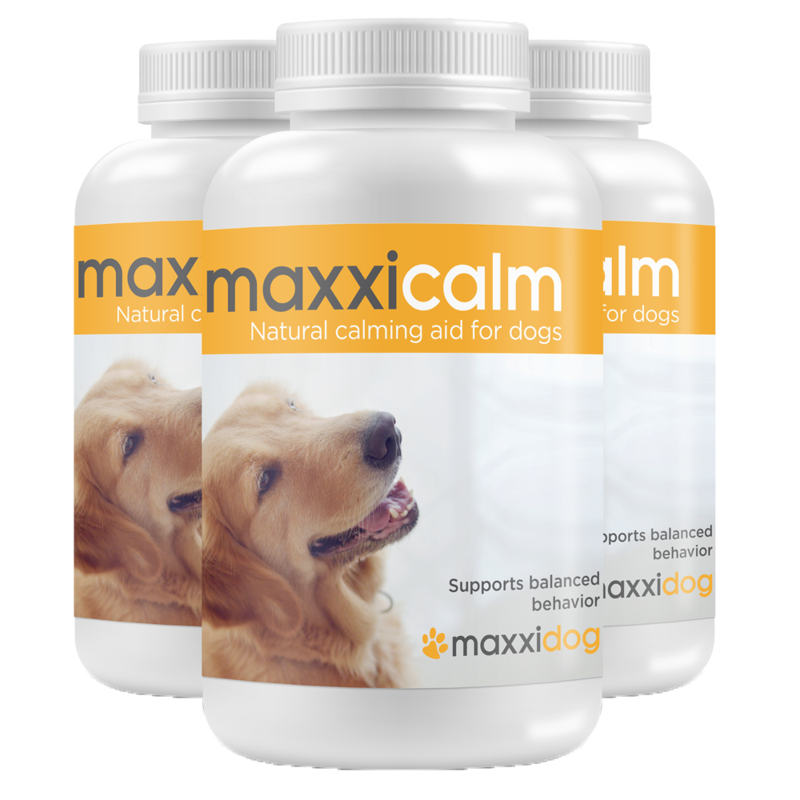 This is why many dog owners prefer to use natural calming aid supplements, like maxxicalm. Like dog anxiety medication, calming aid for dogs does not cure your dog separation anxiety. It can however help to reduce the dog's anxiety level and speed up the treatment progress. What not to do is as important as what to do. You should never punish your dog for what he does while he is home alone. Your dog's destructive behaviour is because he is anxious, and this is his way of coping with his stress. If you punish him, you can make the problem even worse in the future. No matter how hard it is, you must consider it your fault for allowing the incident to happen and look for ways to make sure it cannot happen again. Seek professional help if needed, and sooner rather than later, as dog separation anxiety does not go away without our involvement.